For my tenth video as the Place d'Orleans Fashion Vlogger, I'm showing you exactly how to turn your maxi dress into a maxi skirt (via video!). I absolutely loved the chevron pattern on this maxi dress from Urban Planet but sadly, as you can see, it's more than a tad short. I couldn't pass it up though (it was $19; cheaper than buying the fabric itself!) and knew instantly what I wanted to do--I never even tried it on as a dress in the store, I simply tried it as if it were a skirt! 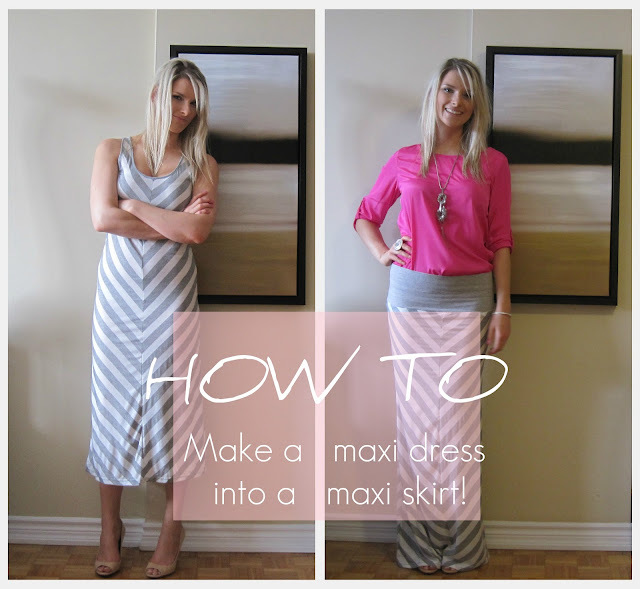 Watch the video below to see a very easy way to use your sewing machine to turn your maxi dress into a maxi skirt. SIDE NOTE: I added a waist-band to the skirt as it wasn't long enough for me without it (I'm 5'11), however, if you're shorter, or your fabric is longer, you could skip the waist-band part altogether. Since this is jersey fabric, if you're not a sewer, or don't have a machine, you can simply cut it and wear it. The jersey will not fray, simply roll a little, which looks charming anyways. Stay tuned for more videos (specifically on the Place d'Orleans FB page). See another maxi dress I turned into a skirt HERE (no waist-band and a simple stitch waist).